I performed on 28th December at Valliammal College Auditorium, Anna Nagar for Karthik Fine Arts in their Music Season Tamil Isai Festival. The ticketed concert had a packed house, most of the audience being first timers for Isai Payanam who were very enthusiastic and enjoyed the concert. I presented ragas Hamsadhwani, Hindolam, Shanmukhapriya in their classical hues and film songs that are based on them. I presented Parvati Nayakane as the main piece of the evening, and Pazham Nee appa, Muthaitharu, and Maraindirunde paarkum were received with thunderous applause. Rasikas love vintage stuff. There were lot of young people in the audience, this was indeed a refreshing sight. 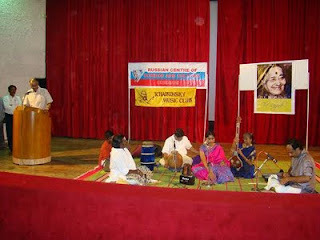 I presented Suttum Vizhi a ragamalika of Bharatiar, an abhang of Tukaram in Revati raga, Revati Thillana by Lalgudi Sri Jayaraman, the crowd favourite Maadu Meykkum Kanne, and finally Karpagame in Madhyamavati. 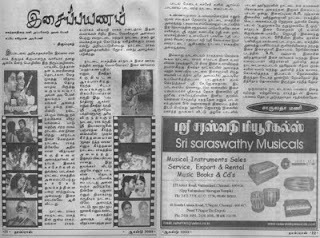 The concert was covered by kumudam.com. I shall share the link here for my cyber-music-lovers when it is ready. 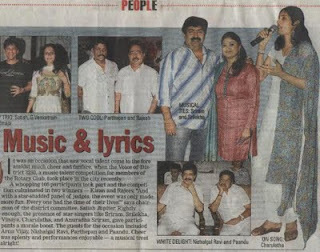 The film Aaravadhu Vanam, had its audio release last week. The music is composed by Haribabu, a talented music director. The song I have sung is a pacy number with Velmurugan. S.R. Ashok Kumar writes in The Hindu Metroplus, "MRG Films International's 'Aaravadhu Vanam' has six numbers by new-find R. Haribabu. The best in the album is ‘Mayiley Oh Mayiley' sung by Sri Madumita and written by R. Bhuvanesh. 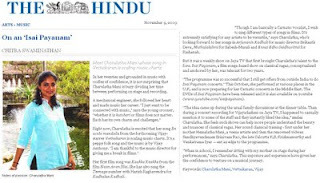 After the hit song ‘En Uchi Mandela', Charulatha Mani gets to sing ‘Andaa Gundaa' with Velmurugan, written by R. Bhuvanesh. J.K.V. 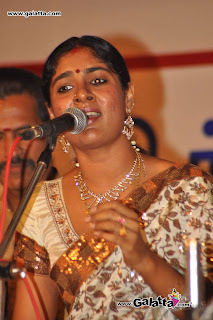 Roshini sings ‘Vinmeena Pidichivandhu', written by R. Bhuvanesh. Muthuvijayan's ‘Kannale Kannale' is sung by Bellie Raj while ‘En Uyire', written by Kugai Ma. 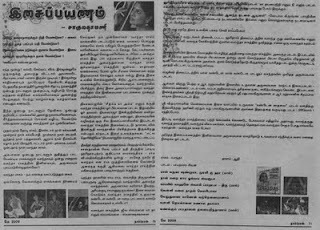 Pugazhendi, is sung by Prasanna and Deepa Mariam. ‘Yarodu Yaridam' sung by Mukesh and written by R. Bhuvanesh is a moving number." It was a bright Saturday morning, and I took stage at the Bharatiya Vidya Bhavan Auditorium for my Isai Payanam concert. The hall was teeming with people and I was excited as I always am before concerts, and this being the music season, is more special to me. I presented raga Tillang, the classical pieces based in it, including the favorites such as Sri Ganesha, Prabho Ganapathe, and Shanti Nilava Vendum, popularised by D K Pattammal amma. The film pieces that followed included the famous Indru Poi Naalai Varai from Sampoorna Ramayanam, and Manadil Urudhi Vendum from the film Sindhubhairavi. The main raga was Kharaharapriya, and I enjoyed exploring its various facets and presenting them to my audience. Thyagaraja's Chakkani Raja, Pakkala Nilabadi and Samanamevaru stood out with regality, while Papanasam Sivan's pieces Senthil Andavan and Janakipathe were well received. 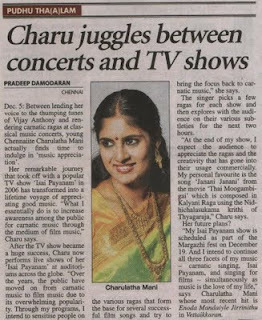 In the film segment Madhavi Pon Mayilal is a song that I have been waiting to present to the audience and those moments when I sang it on stage were unforgettable. Maharajan from Karnan and Mayavalayil from Kulebagavali were other classics. Suttum Vizhi Chudare from Ghajini was well-received by all too. The final raga, Yamunakalyani was handled by me in a sedate fashion, bringing out its innate fragrance through pieces like Bhavayami Gopala, Krishna Nee, Tunga Teera, Uyyala luguma Sri Satya Sai. The film pieces included Sakthi kodu from Baba. I was happy with the tremendous response and the enthusiasm which my dear rasikas showed. The Chennai Music College is a heritage building built in the 1700s with lovely halls, high ceilings, lake view, and a tranquil atmosphere. It was formerly known as Brodie's Castle, after its owner, James Brodie, an Englishman who worked with the East India Company in Madras. He drowned in 1802 while boating on the Adyar river. Ramakrishna Mutt road in fact used to be known as Brodie's Road. The audience included eminent vidwans who form the faculty at the college and enthusiastic students with the will to learn and listen. The hall was fully packed with eager faces. Many of them wanted to know about film songs based on the Classical ragas that I was to handle and the request had already reached me prior to the commencement of the concert. I started the concert with the Gambhiranattai piece "Sri Vigna Rajam" of Oothukadu Venkatakavi, went on to Saramati raga and "Arula Vendum Thaaye" of Madurai Sri Somu. This was followed by "Subramanyena" of Dikshitar in Suddhadhanyasi raga, all with swaras. I also presented GNB's "Ranjani Niranjani" this being the centenary year of his birth. The main piece of the evening was "Kapali" in Mohanam of Papanasam Sivan. Post-thani, I presented "Kanden Seethaiyai" in Bhagesri raga, and other lively items. Very responsive and enthusiastic audience, good ambience. I congratulate the organiser Kalamamani Vazhuvoor Ravi for his efforts. I was accompanied by B. Anantakrishnan on the violin, Thirunageswaram Manikandan on mridangam, and Papanasam Sethuraman on kanjira. 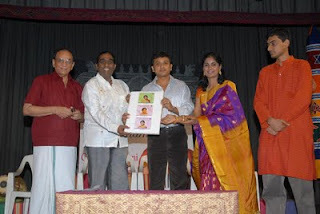 It was a pleasant evening on 7th December 2009 as I took stage at Bharatiya Vidya Bhavan, Main Hall, Mylapore. The hall was full even when I started the show, and outside the organisers had thoughtfully installed projectors for viewers seated on chairs outside to watch and listen to the concert. I was accompanied by B. Anantakrishnan on the violin, and Arjun Ganesh on mridangam. I started out with Sadachaleswaram, the Bhupala Raga kriti of Muthuswamy Dikshitar on the lingam seen at Thiruvarur. I handled swaras at "Kamala Vijaya kara", the madhyama kala passage in the charanam. 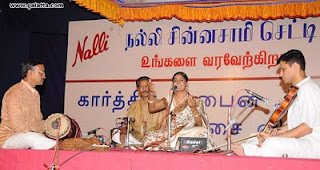 This was followed by the Varamu kriti of Papanasam Sivan, "Thunai Purindarul". I then explained the meaning of the song "Samukhana Nilva" in Kokilavarali Raga of Thyagaraja and sang this piece peppered with a short alapana and swaras. I then presented Raga Purvikalyani, the piece being "Deva Deva" of Swati Tirunal with niraval and swaras. 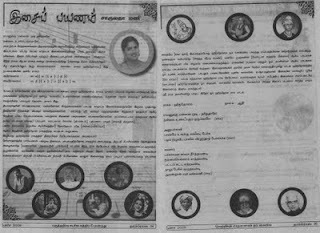 Then came "Akhilandeswari" of Dikshitar in raga Dwijavanti, on Ambal at Thiruvanaikavil. The main piece of the evening was the emotive kriti "Muruga Muruga" of Periasamy Thooran in Saveri raga. The tail pieces included a Sai Bhajan in Raga Kapi, "Chitravati", and "Theertha Vittala" an abhang of Namdev, and finally "Bhaktha jana vatsale" an abhang in Brindavani Raga. I was inspired by Aruna Sairamji when I sang the abhangs, I thank her for her guidance in these pieces. The response was very good. 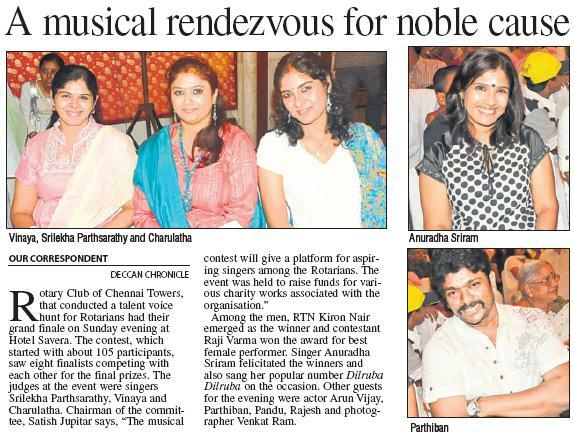 Yet another eventful music season at Chennai is in swing. On 23rd October, my new song "Teenage" from the film Kadhalan Kadhali starring Jai Akash was released. The audio was launched in a function where Devisriprasad was the chief guest, and the song in a western number with Harish Raghavendra, totally rocks! Just listen to it, nice violin BGM too. Nandan Raj is the music director. "Kaatrinile Varum Geetam", my bhajan CD has been released by Sri Krishna Sweets for Diwali, and I just got copies. It has come out well and contains songs like Prabho Ganapate, Subramanyam, Sangita Rasike, Atma Rama, Vaa Vaa Hanumane, Maadu Meykkum Kanne and other popular songs with myself leading and the chorus repeating. A CD for light listening and bhakthi singing, from children to elders everyone will enjoy this offering. I have uploaded the tracks. Enjoy! CDs are available at Sri Krishna Sweets outlets. 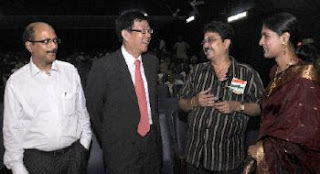 I was a guest of honour at the Indo-Korean film festival held at Film Chamber premises on Monday 19th October. Mr. S. Ve. Shekhar and Mr. Chang, Byung-Suk from Korea Business Centre were present on the occasion. I spoke on how such festivals are increasing awareness of Indian film goers to international cinema. The festival opened with the screening of Memories of Murder. It was a fantastic experience to travel along with Mr. Vijay Antony, music director and co-singers to Jaffna, Sri Lanka, and perform live before an audience of 150,000 people on 25th October 2009. I performed my Naan Avan Illai song and also sang En Uchi Mandaila, and the crowd screamed drrrrrrrrrrrrrrrr!!!!! We had great fun dancing and singing on stage. Colombo is a nice place, good for shopping. Jaffna is very quiet otherwise, slowly recovering I think. Anyway, we all had a great time! 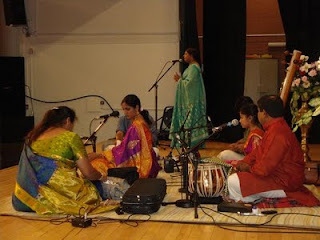 This is the beginning of a new series of blogs by me, called Raga Payanam. You can read about your favourite ragas in this section, the classical pieces in them, anecdotes, and of course film super-hits based on these ragas. Enjoy the musical rain!! An auspicious pratimadhyama, audava raga, a janya of 66th Melakarta Citrambari(just for academic interest! ), Amritavarshini as the name suggests is associated with rain. Muthuswamy Dikshitar is said to have brought rain to the parched lands near Ettayapuram by singing his famous composition Anandamrita in this raga. It is a minor raga, very well –loved by all rasikas, musicians and music directors for its characteristic gait, and brightness. SUDHAMAYI - HARIKESANALLUR MUTHIAH BHAGAVATAR - popularised by the late G N Balasubramaniam, the super-star of music whose birth centenary is this year, this kriti has a lovely chittaswaram also. MAZHAKKORU DEVANE - SRI RAGHAVENDRAR (this is a viruttam type of song sung by K. J. Yesudas, music Ilayaraja, in which Raghavendra Swamy prays to the lord of rain, Varuna for a downpour and extinguish the fire that is destroying the village. As soon as this piece is sung the rain starts and the fire is extinguished. NAAN THAANA - NINAITHALE , the latest addition, music direction Vijay Antony, Sadhana Sargam has sung this refreshing song. I will upload my recent concert clips in Amritavarshini very soon.... As we know music is better heard than read about, but every bit helps!! Hope you all had a lovely Diwali. 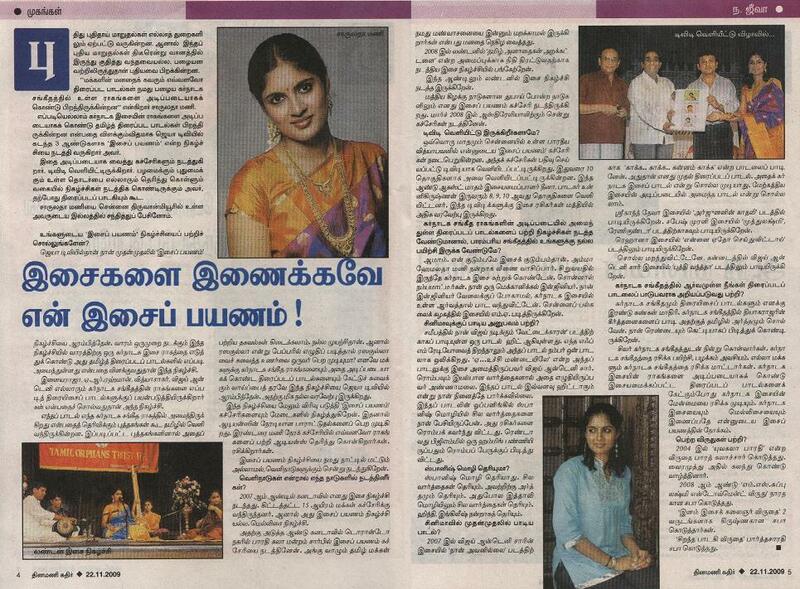 I had nice performances at London, full houses and warm audiences, organised by Tamil Orphans Trust. Very satisfying. Singing for 3 1/2 hours on consecutive days is quite a task, but by God's grace I was able to do it. Sankarankovil is a small town near Thirunelveli. This is where around the 10th Century, a Lingam was unearthed in a “Putthu” i.e sand dune, and was established as the “Sankaralingam” deity. 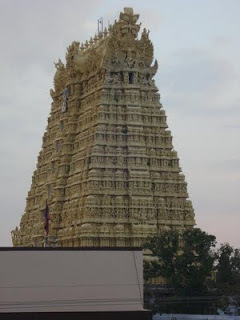 The temple built around this presiding deity is called Sankarankovil. The consort of this Shiva form is the beautiful Gomathy Amman. A petite statue with pleasing facial features, not more than 3-feet tall in appearance, Gomathy Amman, our family deity is indeed the pride of this place. 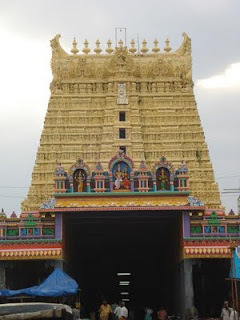 During the month of Aadi Gomathy Amman does a penance “Aadi Thavasu” and at the end of the 10 days the lord presents hiumelf in the “Sankaranarayana” form, half Shiva and half Vishnu, and this alankara is unique to witness. I had the good fortune of visiting Sankarankovil yesterday, the third time after my wedding. I made the customary “Maavilakku”, in which one mixes rice flour and jaggery with coconut water, pours ghee and lights a “deepam” at the centre. A very tasty offering, the “maavilakku” is offered to all family members and other devotees after the ritual. My family and I watched abishekam, and we had given a red and gold saree for the godess to adorn after the abishekam. She looked beautiful. There is a Srichakram on which I sat and sang the Kamalamba Navavarana in Anandabhairavi, and also the Sri Chakra Raja Nilaye of GNB in the raga Sivasakthi. I also recited the Mahishasuramardhini Stotram and we enjoyed the spirituality and experienced happiness. Even the children though very young helped out with the arrangements. The putthu sand has healing properties it is said, so we brought home some “putthu mannu” as it is called to give to friends and relatives. We stayed at a friend’s house, a lovely old house built with verandahs and low ceilings, very cool exuding old-world charm. We were treated to a rare koottu, one with raw mango and lady’s finger, an interesting combination. I wore the traditional 9 yards saree, I like it very much, and whenever there is an opportunity don’t hesitate to wear it. Learning it was quite a task but once I mastered the procedure, it’s a question of less than 5 minutes to get the right look. Did you know that poet Subramanya Bharathi has composed a song on Gomathy Amman during one of his numerous visits to the temple? Cyberian music lovers, I am very happy to announce that I have founded the "Isai Payanam Trust" to promote music among all those who have the slightest interest in it! Family and self tried out the new Mocha Mojo in Indiranagar. Designed in a 70's theme, with hit numbers from that period playing in the background, it was definitely different. The menu covers are even fashioned from old vinyl records. Our experience with what actually landed on the table was a bit mixed though... The bagels, panini, raw-garden lasagne were tasty. Unexpectedly, the coffees were a fiasco, whether it was a simple cappucino or a so-called "specialty" Antigua brew. Their over-priced Lindt hot chocolate took the cake...a white milky beverage in which a Lindt choc bar had apparently been dipped for a few nano-seconds. The only thing it had in common with the indulgent heisse shokolade served in Viennese, Swiss cafes, was ... the price. The past few weeks have been quite hectic, concerts, recordings, kids going back to school and finally walking the ramp like a model in a fashion show exclusively by singers at the Tamil Music Awards launch. It was a great experience, walking the ramp first in an elegant saree, then in an evening gown designed professionally to fit us in an Indo-western style. A rare evening to remember when we interacted with our colleagues in the playback industry on and off stage, cracked jokes and finally rocked on the ramp. There was tremendous press coverage and response from all sections of the audience. 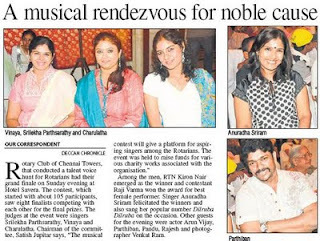 What's more, I shared space with my sister and playback singer Srimathumitha. The weather only gets worse out here in Chennai with every passing day it seems. I am just recovering from a throat infection, and thankfully am out of it. I make it a point to listen to music that I like while working out on the exercise bike... thats the advantage of working out at home itself, you get to choose the music, and that's very important for a musician! Well folks, I'll sign off now. A little busy with A.R.Rahman special episodes of "Isai Payanam" on Jaya TV. .. Bye. 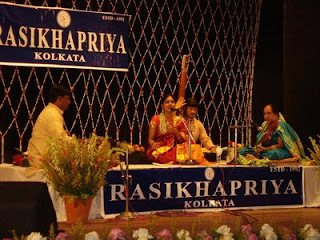 On 29th May I performed for Rasikapriya Sabha, Kolkata, It was an Isai Payanam concert, and I handled ragas Hamsadhwani, Hindolam, Charukesi and Kalyani in Classical and Film music. The audience was very nice and interested, and the auditorium and sound was state-of-the-art. Enjoyable experience. Kolkata is a nice metro, lesser known, less talked about, but teeming with life and quaint. Its old-world charm and heritage buildings, narrow gullies, crowded markets full of rustic cheerful faces smeared with a paan stained smile, women with conch shell bangles, forehead sindoor and Bengal cotton sarees….indeed very refreshing. After the concert we had a nocturnal visit to the famous Kali Temple, had a good darshan and later I shopped (a tad too enthusiastically) for lovely Bengal cotton sarees with long borders in bright hues. Yesterday was a memorable day in my life. I had the opportunity to sing at the inauguration of the Sri Krishna Balaram Temple of ISKCON established mow at Valmiki Nagar, Chennai. 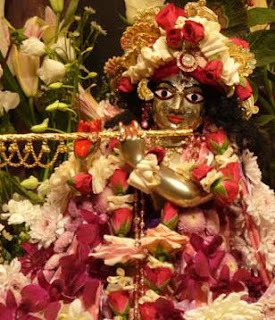 I have been a Krishna devotee for the past 4 years, but little did I think I would get such a golden chance to present my musical offering at his lotus feet on such an auspicious day. The deities were beautifully made statues in Panchaloka material. 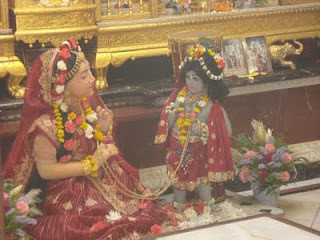 Elaborate pujas and homams were performed. This will be an evening to remember…. Today I sang a film recording for music composer L.V. Ganesan, son of music composer Sri L. Vaidhyanathan (his brothers L. Subramaniam and L. Shankar are also noted musicians). Folk number…good fun singing! How have you all been? Vacationing at exotic locales, or chilling out at the local beaches or curling up in the comfort of your AC rooms reading a book? I took off to Goa for a five-day break this summer with my husband and one of the twins (the boy), the reason being he is the one who loves a swim, and she prefers her time indoors with books, or chit chatting away with my sis whom she considers her fashion guru (dressing in pink, latest hairdos, ribbons, dancing shoes etc.!!). 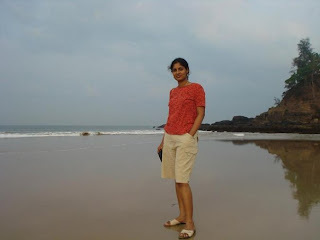 Anjuna beach was rockier and more picturesque, like the one you see in movies. I got some good photographs of us having fun in the sun. Anyway back to the good work and singing in good old Chennai. Last week I recorded a couple of movie songs, and did a shoot in Raj TV's Top Singer. Off to Calcutta next week for a concert, and by the way, how did you all react to the elections? I thought ...... (no comments, I know only to sing!!). I cast my vote, and am proud of myself for doing my duty as an Indian citizen... Wonder when that black mark on my left index finger will disappear, it looks .............hmm....... unprepossessing. Ok my friends, thanks for reading all this.... and take care. The elections are moving closer and I am thinking about the effect this could have on us musicians. A popular Tamil magazine's senior reporter and friend called me and said " Ma'am why don't we do an article with singers telling us their preference in voting in the upcoming elections? Let me start with you". I almost fell off the chair in shock, "please.... I hope I have a long and bright career ahead, please don't jeopardise it with a question like this!". "There, there", the cheerful reporter said "Today is April 1st ma'am". Having to go to the booth to cast our vote in the hot summer heat is indeed a very challenging ordeal but still worse is the selection process as to who to cast the vote for. Anyway I shall give away no clues as to who I will be voting for, it is a secret ballot you see, which is why in our country many people secretively even refrain from voting. Why not, anyway your vote shall be cast in complete secrecy by someone who passes off as you (second life avatar perhaps?). Friends please eat Tofu for vocal and holistic health, I heartily recommend it for voice users whether you are singers striving to get a sangati or emotion across or election campaigners struggling to get your point across or annoyed mothers of rebellious teenagers shouting to get yourself heard over inadmissible decibels of music. The vocal cords are muscles and they can be strengthened with tofu I believe and this view has been endorsed by my singer sister Srimathumitha. Disease resistance is also built up by consuming tofu. Just an innocent little tip folks, please donot conclude that I have a Soy paneer factory as a side business..... Oh no , surely not. 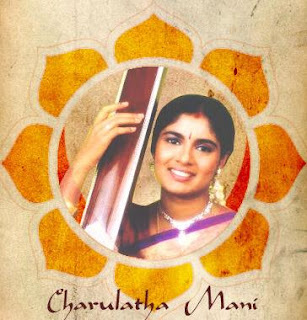 And before signing off, I would like to recommend my pick of the day - the Dikshitar kriti Maaye in the raga Tarangini sung by Dr. M. L. Vasanthakumari is a stunner, please do listen to it if you can get hold of it somewhere. Ok my dears, bye for now.... Somebody please do something about this heat in the summer!!!!!!!!!!! Wish you all a very happy and prosperous Tamil New Year 2009-2010. 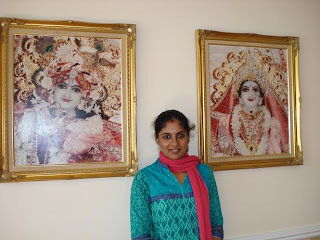 Invoking the blessings of the Supreme Lord Sri Krishna, I begin my blogging pursuit. I am known to many as a singer, I also love to interact with my rasikas by speaking during the concert. On Isai Payanam in Jaya TV I explain the sahitya and raga bhavas and also the usage of ragas in cine songs. So much for the speaker in me. Mango Pachidi is indeed a delicacy, friends, what with all its tangy flavour of the seasonal fruit, dripping in jaggery paagu, the occassional dash of the neem flower combined with the aroma of green chillies. A treat I ate with great delight for lunch today. The New Year brings in plenty of heat, lots of sweat, cartloads of mangoes, and long days indoors. I use this time for listening to more music, minding my little children the twin troubles that I enjoy tending to, and practising. 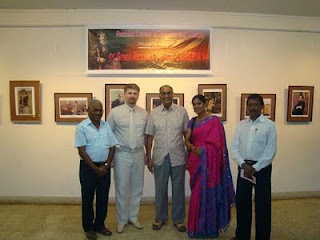 I performed in Delhi for a lovely Tamil audience last month. I didn't have much time for sight seeing, though I promised to myself that I would surely explore at least the main parts of Delhi at a later time. Delhi Tamil audience are very sweet, they made sure I sang for a good three hours, and even after that chits kept coming on to the stage. I assured them that I would certainly come back very soon. Anybody from Calcutta out there? I am singing for "Rasikapriya" organisation on the 29th of May at Calcutta. You may contact one Mr. Kannan for info on venue, I shall also be posting details. 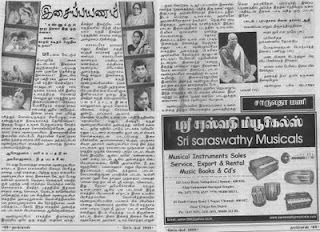 I sang Raghuvamsa Suthambudi the Kadanakuthuhalam kriti at a recent Rama Navami Concert in Chennai, and really enjoyed the experience. I felt a sense of elation and happiness while singing, and that was infectiously communicated to the audience. During the chittaswaram a few children started dancing spontaneously, overjoyed. Such is the nature of this raga, it radiates happiness. This kriti is often played on instruments than sung, but when sung it is a winner. So much for this instalment, friends... The year is called "Virodhi" but, what's in a name? (Virodhi means enemy in Tamil and Hindi!) Well then, lets all have a happy and friendly "Virodhi" year!